WE ARE LOOKING FOR TRUE DOGGY LOVERS TO HELP SPONSOR DOGS THAT HAVE VERY LITTLE CHANCE OF EVER FINDING A LOVING HOME DUE TO THEIR AGE, HANDICAPS OR INTENSE FEAR OF THE HUMAN TOUCH. MOST SHELTER DOGS COME WITH SOME 'BAGGAGE' FROM THEIR PAST EXPERIENCES. MOST OF THEM FORGET WITH GOOD FOOD, CUDDLES AND TLC. BUT SOME CAN NEVER FORGET THEIR TRAUMAS AND ARE DESTINED TO STAY IN A SHELTER FOREVER. IF YOU WOULD LIKE TO SPONSOR ONE OF THESE, PLEASE GET IN TOUCH VIA OUR CONTACT PAGE. SPONSORSHIP IS BASED ON 150€ PER YEAR, THAT IS 12.5 € PER MONTH TO HELP WITH FOOD AND MEDS. ELECTRA is a small version of a Portuguese Mountain Dog, Cao da Serra da Estrela. She was one of 30 PMD's we rescued from an old breeder in the north of Portugal two years ago. The whole story is on our website under Estrela rescue. 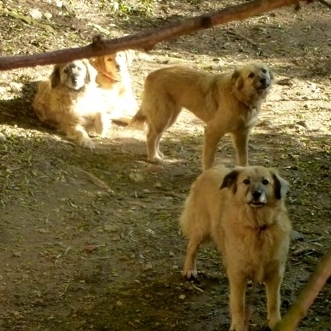 Electra was rescued together with her mother Camilla and her brother Tristan. Both are still with us. Electra is very nervous of humans and cannot be adopted. She will stay with us forever. We think she is about 6 now and she lives in a group with Ronnie, her mother Camilla and auntie Francesca. Mum is very friendly with people and a good mum for her children. Flash is medium size, +/- 18kg and 50cm. Flash has now been here for more than 3 years and nobody showed any interest in her. Her pups are extraordinary dogs, one now being trained as an assistance dog for diabetes and one being trained as a sniffer dog for rescue. BUT Flash just runs around the dog run and still has no home. She is a lovely, gentle dog and will thrive in a home of her own. Very affectionate and people orientated, eager to please. Gets on with other dogs but probably not cats in an outside environment. She is now about 5 year old, spayed and vaccinated. He was one of 30 PMD's we rescued from an old breeder in the north of Portugal two years ago. The whole story is on our website under Estrela rescue. Tristan is still very nervous of humans except us and cannot be adopted. We think allthough he is much better than his mother and sister that he will stay with us forever. We think he is about 6 now and he lives in a another group enjoying some more freedom. 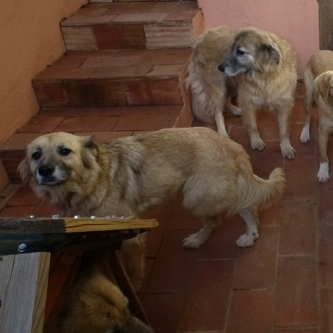 FAWLTY appeared at a Swiss couples house full of ticks, fleas and extremely thin. Abandoned or lost, who knows. He was about 5 months then. The couple already had animals and couldn't/wouldn't keep him so we felt sorry for the dog and took him in as usual! Fawlty is a lovely boy but a great attention seeker and he prefers women to men. In hindsight, we do believe he was badly treated by a man before he came to us. He is very social with all the dogs and comes when you call him. He has lived in our kennel far too long now and needs a permanent home with a person or people who have time and patience for him. He is now about 6,5 years old, castrated, vaccinated and tested negative for blood parasites. He is now already more than 6 years with us and we think he will stay with us forever. CAMILLA is a small version of a Portuguese Mountain Dog, Cao da Serra da Estrela. Camilla had a daughter Electra and a son Tristan, both of them are still with us. Camilla is still very nervous of humans and cannot be adopted. She will stay with us forever. We think she is about 8 now and she lives in a group with Ronnie. There are two more like her in that group, which are Francesca and Electra. SAMMY came here 15 months ago with several external wounds and a broken leg, very swollen. He lived on the street and nobody wanted to help him. He was very thin and depressed. We took him to our orthopaedic vet and the prognosis for the leg is not very good, probably amputation. He also tested positive to 2 types of tick fever and has been on lots of medication for all his problems. As his mate Anuca has been adopted Sammy is all alone in his kennel. He is a young dog and very sweet but he will be handicapped all his life so an adoption will not be easy. 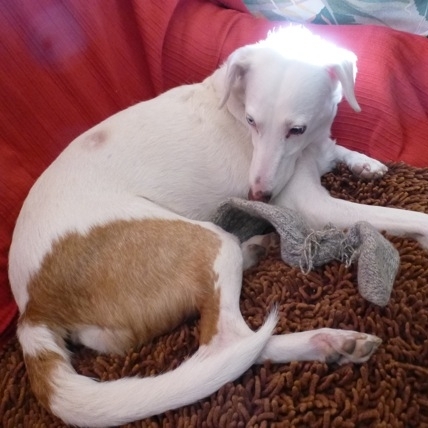 RONNIE was rescued 4 years ago from a killing station= Perrera, in Huelva, Spain. The volunteers there sent out an SOS because they were killing 5 dogs a day. We went and took out 7 dogs of which 6 were homed but Ronnie, who was lying half dead under several large dogs, has never recovered mentally from this traumatic experience. He is afraid of all humans and will not let anyone touch him at all. He is fine with the dogs he lives with and will stay with us forever. FRANCESCA is a small version of a Portuguese Mountain Dog, Cao da Serra da Estrela. Francesca had a daughter and she was adopted in Wales. Francesca is very nervous of humans and cannot be adopted. She will stay with us forever. We think she is about 8 now and she lives in a group with Ronnie. There are two more like her in that group, which are Camilla and Electra. ROBERTA is another example of profound cruelty. She was kept in a ruin on a chain 24/7 by a gypsy family. When we rescued her by stealing her during Sunday lunchtime when most people are eating and drinking alcohol, her ears were necrotic, she was full of ticks, fleas, mange and had difficulties walking. Both ears had holes punched in them and were being eaten alive by flies and maggots. She tested positive for tick fevers and heartworm which we all treated. 6 months later she developed mammary tumours and had all the mammaries removed. 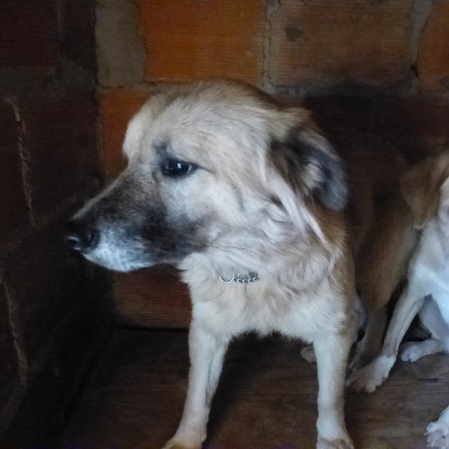 Poor Roberta, nobody wants to adopt her but she is a nice little dog and very social with humans. Not very social with other dogs but tolerates them. She is about 5/6 years old now (2017). So she can stay here with us forever if necessary. Her complete story is on the website. Dogs for adoption button scroll down to almost the bottom. 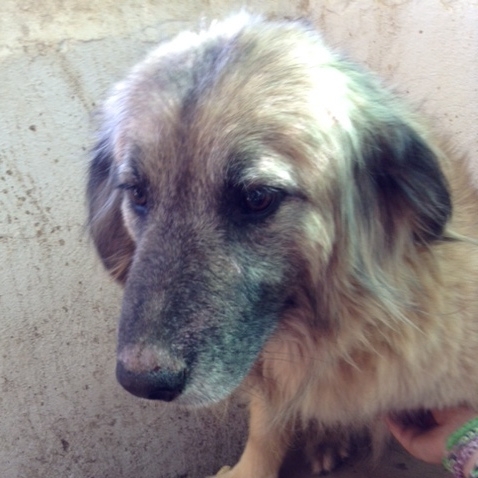 BRUNA also came from the Hell Hole in the north of Portugal. She lived in a dark, long narrow concrete cell and had pups in there. When we found her she only had one puppy of 3 weeks old. 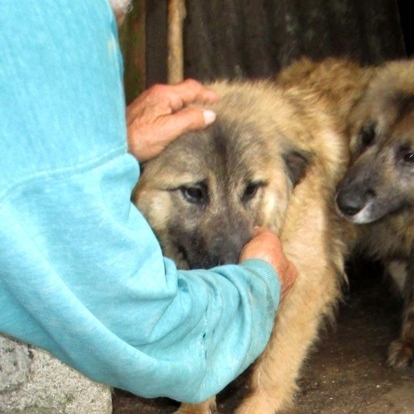 She was petrified of everything outside, just like Francesca, so we put her and her pup in our cattery in the garden where they were together and quite safe and could see plants, trees, other dogs and breath fresh air. The pup we called Brunetto and he developed into a normal dog and now lives in Scotland. Bruna is so very scared of humans and runs away all the time. She has a kennel to sleep in and when she gets in there in her basket we can stroke her. She will now take a biscuit out of your hand, after 3.5 years with us. She cannot go for adoption and will stay here forever. CHIARA is one of 7 female pups born in the wild at Christmastime to a stray mother we called Cindy in a village in the hills west of Sao Bras. All were very “wild” when discovered and Cindy and Chiara had to be caught in a dog trap. Female pups HAVE TO BE RESCUED as if they were to stay in the wild it would mean an average of 40 pups by next Christmas. The girls were very pretty and soon had adoption families abroad BUT when the time came for Chiara we realised she could not go at that moment ..she was still too traumatised and ran away from everybody and every strange thing. It is now december 2017 and Chiara is still with us and her mother is still in Goldra shelter. Neither are adoptable. ISOLDA, she was a wild female living at a local supermarket and had pups several times. One day a rescue group caught the pups and took them away BUT they left the mother which means she would be pregnant again in 6 months and then more pups and more pups......4 of the pups got very ill with Parvo and we nursed them on drips in our guest room because the vet could not accommodate so many sick pups. One died in our arms!! The other 3 survived and were adopted in Holland. They were very beautiful and we still have contact today. However, it took us months to capture the mother, months of patient feeding and getting her confidence sitting on the grass in front of the shop. She was very nervous of all humans. We took her home and let her find her own way around the garden and the garage. It took us TWO years before we could touch her. Now she is much more relaxed and we can stroke her when she wants it. But she cannot go for adoption anywhere as we are afraid she will then become very nervous again so she will stay with us forever. Isolda is about 8 years old now.